Successfully Added Video Door Phone + Monitor - 7 Inch TFT Screen, 700TVL, Electric Door Control, Two Way Audio to your Shopping Cart. 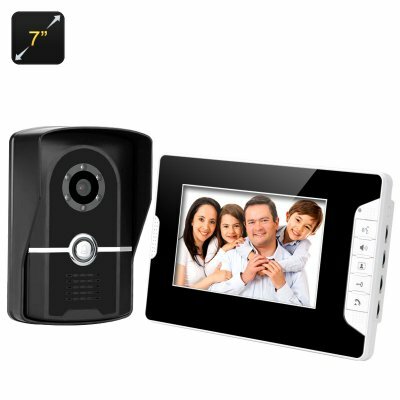 The video door phone brings convenience and security, this easy to install security gadget ensures that you never have to put you and your family at risk by opening the door to see who's there. With great features and superb functionality this video door phone has everything you need for top level home or business door security. The 7 inch TFT monitor can be easily connected with the door camera using the 5 meter cable that comes included in the package and once set up you will be able to see clear 840x480 resolution images of all those paying you a visit. When visitors press the doorbell you will be alerted by the monitor which not only let you know when someone is calling but brings you a visual display so you can see exactly who's there. Two way audio allows you to communicate directly with those outside at the push of a button, so don't have to open the door which brings extra security and convenience for you and your family. If your door has an electric lock then you can simply connected it direct to the system and grant access to you home through the video door panel. With 6 ID cards and support for up to 200 users this video door phone is suitable for security gate access to apartment blocks, offices or small businesses. This video door intercom with 78 inch monitor comes with a 12 months warranty, brought to you by the leader in electronic devices as well as wholesale video door phones..